Bolsters and wedges can be used for a variety of therapeutic techniques and exercises. 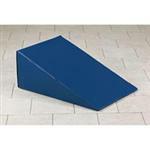 Made of high quality materials, we offer bolsters and wedges in a variety of shapes and sizes. From Skillbuilders and Tumble Forms to Valu-Forms and traditional table bolsters and wedge bolster pillows, we have the selection you are looking for. Our physical therapy wedges and bolsters are designed to last, and we offer wedges and bolsters for virtually every type of physical therapy exercise.